For many people, saving money is a struggle. Yet, if you want to get out of debt, build an emergency fund or even save up for a house, you have to find a way to grow your savings. Save money with every paycheck and get paid up to 2 days early. This tried and true savings method means you save a portion of your paycheck each month before paying your bills or spending the money elsewhere. This way, you won’t squander money away on needless purchases and you’ll instead get one step closer to your financial goals. To make it simple to pay yourself first, the Chime app offers a feature called “Save When You Get Paid.” Once you sign up for an account, you can automatically direct 10% of every paycheck into your Chime Savings Account right when you get paid. To keep track of your progress, all you have to do is use the app to check in on your savings account. As an added perk, you can get paid up to two days earlier* with Chime than if you were to set up for automatic deposit through a traditional bank. It’s a great way to get a jump-start on your money goals. Automating your savings is a sure-fire way to start saving money without giving it a second thought. By enrolling in Chime’s Automatic Savings program, you will be one step closer to achieving your money goals. 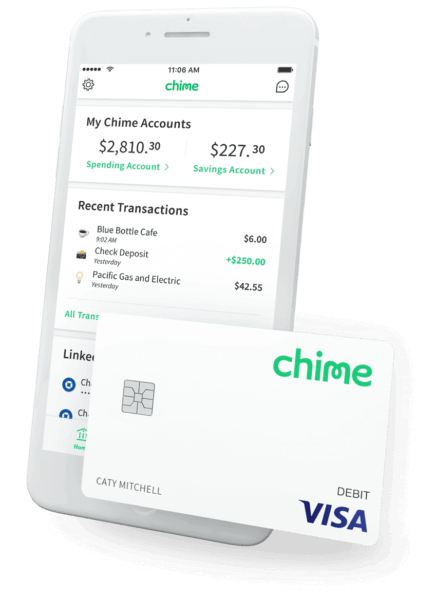 In fact, you can use the app to sign up for a Chime account and debit card today and you’ll save money every time you use your card to make a purchase. That’s right! Chime will move money into your Savings Account effortless and automatically every time you use your Chime Visa® Debit Card. How much? It depends on how often you use your card. In a nutshell, Chime rounds up each transaction amount to the nearest dollar and transfers that round-up amount from your Spending account into your Savings account. If you make a lot of purchases, your round-ups could amount to hundreds of dollars each year. As you probably know, you typically have to use ATMs within your bank’s network in order to avoid those annoying fees. If you use a bank outside the network, you guessed it: You’ll see a charge on your statement. Indeed, these fees add up fast. But, if you have the Chime app, you can locate and use 24,000 fee-free ATMs. This gives you access to a larger fee-free ATM network than offered through big banks like Chase, Bank of America, CitiBank, or Wells Fargo. Better yet, you can use the Chime app to locate more than 30,000 cash-back locations, including those at big box retailers like Walmart, Target and supermarket chains. Keep track of your finances on the go. By using the Chime app, you’ll get a push notification for every transaction and a balance update every morning. This way you will always know what your bank account looks like. Being constantly in the know also gives you an opportunity to curtail spending or even transfer money from your Spending to your Savings account to help you meet your goals faster. And one more thing: You’ll get a notification every time you receive a deposit – keeping you abreast of your money sitch at all times. Send money and get paid instantly. By using Chime app’s “Pay Friends” feature, you no longer need to worry about being stuck footing the bill when you dine out with friends. Got shared household expenses? By using the “Pay Friends” option, you can also split up and pay for these bills without feeling like a collection agency. In fact, when you use “Pay Friends,” you can easily pay and accept money from other Chime members who also have this mobile wallet feature. To start today, simply log into the Chime app, click on “Move Money” and look for the Pay Friends option. You can even create a Chime nickname and search for friends who also use the app. Want to get your friends on board? Go ahead and use the app to invite them to make the switch to banking with Chime. You’ll then all be on your way to paying the amount you actually owe, accepting payments right away, and earmarking more money toward your savings goals. Are you ready to check out the Chime app and start saving more money today?